Auto transformers are often chosen as an economical alternative to distribution transformers when electrical isolation between the primary power source and the secondary load is not required. They are used to match the supply voltage to the specific equipment voltage required and do so by tapping off of a common winding, therefore reducing both the size and the weight of the transformer required compared to an equivalent distribution transformer. 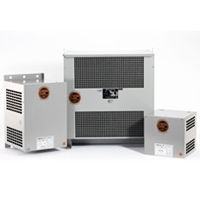 These units are available both in single and three phase, can be used in either a step-up or step-down direction, and can be ordered in 60Hz or 50Hz designs. The benefit in using these transformers instead of popular buck-boost combinations is that no complicated connection charts or internal jumpers are necessary. You simply install, connect the cables to the labeled lugs, and energize. Typical applications are motor loads, industrial machinery and inductive loads such as electric heating. It is important to note that auto transformers are not recommended for use with equipment with electronic controls, DC components or for computer applications. For use with motor and other inductive loads. Both input and output voltages are tapped from a common winding rather than seperate coils as in double-wound (isolation transformers). Not recommended for use with electronic controls, DC equipment or computer applications. Totally-Enclosed in epoxy resin for installation in areas with hazardous gases, dust and moisture. Designed for use in class 1, division 2 group A-D locations with a temperature classification of T3C, T4 and T5. Available with 4X stainless steel enclosures.